Check out our Bacon-Brussels Sprouts Gratin. 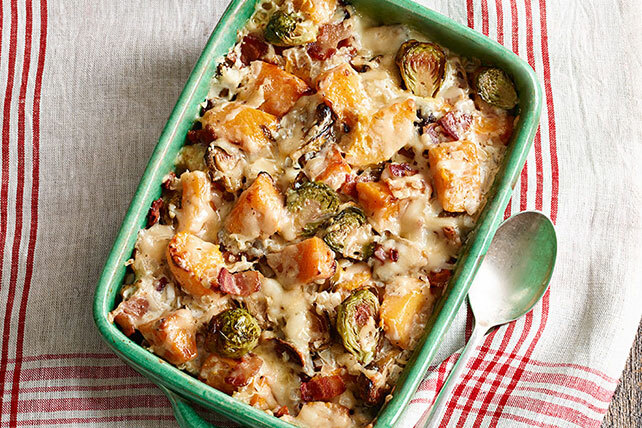 This Bacon-Brussels Sprouts Gratin includes butternut squash, which adds to the heart and soul of this dish. Toss Brussels sprouts and squash with oil; spread onto foil-covered rimmed baking sheet. Bake 30 to 35 min. or until crisp-tender, turning after 20 min. Meanwhile, cook and stir bacon in large skillet on medium heat until crisp. Use slotted spoon to remove bacon from skillet; drain on paper towels. Discard all but 2 Tbsp. drippings from skillet. Return bacon and reserved drippings to skillet. Add onions; cook and stir 10 min. or until crisp-tender. Add cream cheese spread and broth; whisk until cream cheese is completely melted and mixture comes to boil. Simmer on medium-low heat 1 min. or until slightly thickened, stirring occasionally. Transfer vegetables to 2-qt. casserole sprayed with cooking spray. Pour cheese sauce over vegetables; mix lightly. Sprinkle with shredded cheese; cover. Bake 20 min. or until heated through, uncovering for the last 5 min. Vegetables can be roasted ahead of time. Cool, then refrigerate up to 2 days. When ready to serve, spoon vegetables into 2-qt. casserole as directed; continue as directed, increasing the covered baking time to 25 to 30 min. or until vegetables are heated through. To make this dish for a large gathering, prepare as directed doubling all ingredients and baking in a 13x9-inch baking dish. To prevent the melted cheese from sticking to the foil, spray foil with cooking spray before using to cover casserole.